“With this ring I take you as my wife/husband (…)”. Is the common phrase we hear at weddings; for wedding participants it is just the same thing they have seen before, for the grooms it is the sacred moment they unite and make it all symbolized in these two pieces of jewelries. The wedding rings have no comparable term and sentimental value that’s for sure. Sow when deciding about what types as design and style to choose it must be a really difficult choice. So like when deciding to get married is for ever after commitment, the moment to agree being with this person the whole life the rings are alike: the time to decide what ring will stand on your finger from now on. It’s not easy at all but prices will make the difference and so restrain the options for you. Simple wedding rings will become the final remain viable solution. 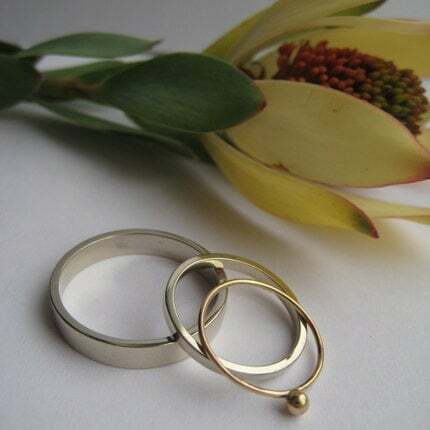 Simple wedding rings are the traditional, classic style, with thin look. People who like this style as general idea will prefer such rings without thinking at the price part. Simple wedding rings are maybe the lack of interest expression for fancy styles. It can be about not liking to wear jewelries and such rings needed just as formality. Simple wedding rings can be the compensatory part of having either a gemstone on the ring either an engraved inside part. So to keep the price at an affordable limit it is chosen just one thing. Simple wedding rings are usually the man version. They think anything with design is a feminine style so they prefer plainness.